Today I have someone extra special on the show and by extra special, I mean that this person is one of the main people responsible for introducing me to entrepreneurship. Tina Seelig is a professor in the Management Science and Engineering department at Stanford University. She’s also the faculty director of the Stanford Technology Ventures program of which I was a member. And most importantly, she was my professor of entrepreneurship way back in 1999 along with Professor Tom Byers. Recently, she released a brand new book called Creativity Rules: Get Ideas Out Of Your Head And Into The World that you should definitely check out. Click here to grab a copy! You’re listening to the my wife quit her job podcast the place where I bring on successful bootstrapped business owners, and delve deeply into what strategies are working and what strategies are not. Now today I’m thrilled to have someone really special to me on the show. 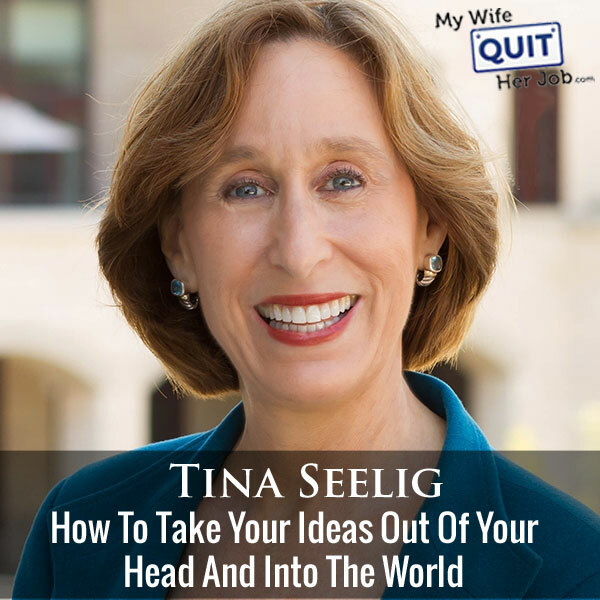 Tina Seelig is a professor in the management science and engineering department at Stanford University, and she happened to be my professor of entrepreneurship back in 1999 when I was at Stanford. I know you’ll love this episode. But before we begin I wanted to give a shout out to Seller Labs for sponsoring this episode, and specifically I want to talk about their awesome Amazon tool, Scope. Now if you know me, I always get really excited about the tools I like and use, and Scope is a tool that actually increased my Amazon sales on several listings by 39% within the first week of use, crazy, right? Now what does this tool do that could possibly boost my sales so quickly? Well, quite simply, Scope tells you what keywords are driving sales on Amazon. So here is what I did. I searched Amazon and I found the bestselling product listings in my niche and then I used Scope to tell me exactly what keywords that bestselling listing was using to generate sales. I then added these keywords to my own Amazon listing, and my sales picked up immediately. So today I use Scope for all my Amazon products to find high converting keywords in the back end as well as for my Amazon advertising campaigns. So in short, Scope can boost your Amazon sales almost immediately like they did for mine, and 39% is nothing to sneeze at. Right now if you go to Sellerlabs.com/wife you can actually check out Scope for free, and if you decide to sign up, you’ll get $50 off of any plan. Once again that’s Sellerlabs.com/wife. Now, I also wanted to give a shout out to Klaviyo who is also a sponsor. Now Klaviyo is the email marketing platform that I personally use for my ecommerce store, and I actually depend on them for over 20% of my revenues. Now you’re probably wondering what’s Klaviyo all about, and what makes it special. Well Klaviyo is the only email platform out there that is specifically built for ecommerce stores, and here is why it’s so powerful. Klaviyo can track every single customer who has shopped in your store and exactly what they bought. So let’s say I want to send an email out to everyone who purchased a red handkerchief in the last week, easy. Let’s say I want to set up a special auto-responder sequence to my customers depending on what they purchased, piece of cake, and there is full revenue tracking on every single email. Now Klaviyo is the most powerful email platform that I’ve ever used and you could try them for free at mywifequitherjob.com/K-L-A-V-I-Y-O, once again that’s, mywifequitherjob.com/K-L-A-V-I-Y-O. Now, on to the show. Steve: Welcome to the My Wife Quit her Job Podcast. Today I have someone extra special on the show, and by extra special I mean that this person is one of the main people responsible for getting me into entrepreneurship in the first place. And this person is none other than Tina Seelig. She is a professor in the management science and engineering department at Stanford University. She is also the faculty director at the Stanford Technology Ventures Program of which I was a member, and most importantly she was actually my professor of entrepreneurship way back in 1999 along with Professor Tom Byers. Now Tina is also a well accomplished author, and has written 17 books that have sold extremely well. She’s an accomplished public speaker, and travels the world teaching entrepreneurship as well. And with that, welcome to the show Tina, I am so happy to have you on today. Tina: Thank you so much, it really is my pleasure. Steve: So what’s funny about this interview is that we’ve always had this like Professor-student relationship. So I actually have very little knowledge about your past. And so I was just kind of curious for my knowledge at least, how did you get into entrepreneurship, and how did you end up at Stanford? Tina: Yeah, you know what, it’s such a funny question, because of course all of us have such interesting, and circutous paths in our career, and mine certainly is. I don’t know if you know I started out, I did my PhD in Neurophysiology. I did my PhD at Stanford Med School, and when I finished way back in 1985, I said, you got to be kidding, I really — the money for research was drying up. I was going to have to go do post docs all over, and although I was you know really love neuroscience, I don’t think I was the best neuroscientist in the world. And I thought I really want to get out into industry and see how people take their ideas, like the things that come out of the lab and actually turn them into products. So I ended up going into industry, which is its own interesting story about how do you actually transition from being a scientist to going into the industry? That was not an easy path, and I’m happy to share some of the funny stories there about trying to sort of change careers. But it’s a very long circuitous path doing lots of different things. And then in 1999, which is the year I met you, I saw a job posting about this new Stanford technology, this program, and I thought, wow, that sounds like an incredible confluence of education and technology and entrepreneurship. And I threw my hat in the ring. Steve: Wait, was that the first year? Tina: Yeah, you were like my first students, the first Maytho [ph] fellows. Steve: I had no idea, wow, that’s so awesome, I did not know that. Tina: I was totally green, I was totally green. Honestly, I wish we could go back and do it again. Steve: So Tina recently sent me one of her awesome lectures on bringing entrepreneurship ideas to life, and that’s what I’m going to discuss today with the listeners here. So here’s the thing Tina, so many of my listeners and readers, they often complain that there aren’t creative or they aren’t innovative. So the question I’m hoping that you can answer today is one, can you learn to be more creative and innovative, and can you actually teach entrepreneurship? Like a lot of these people come to me and they say, hey I’m just not a creative person, I don’t think business is cut out for me. Is this like an innate talent? Tina: Oh my gosh! Thank you so much for asking this. Honestly I get asked this all the time, and I am delighted to answer this question. First of all creativity is not like eye color that you can’t change. It is something like every other skill that can be learned, can be improved, can be mastered, the same is entrepreneurship. I mean would you ever say — I mean no one says, can you teach math, or can you teach science or history or even can you teach music or sports. Like we assume you can teach us. I mean I might not be a world class musician or athlete, but certainly I can get better with training. And so the same is true with creativity and innovation and entrepreneurship. The other thing that is critically important here is that we are all creative. I mean look at any little kid, they’re creative. Think back to when you were a little kid, you know everybody is creative, and unfortunately our school system is designed to essentially beat it out of us, because — and this is sort of one the areas I’m most passionate about is like how do we rethink the way we teach, because our school systems are designed in ways to be able to measure the impacts of teaching. Well that sounds like a good idea right, except creativity is hard to measure. And so because it’s hard to measure, we don’t teach it because it’s hard to measure. In fact one of my favorite quotes about this is the quote is, “Not all things that count can be counted, and not all things that can be counted count.” And unfortunately the problem is because creativity is hard to count, we don’t count it and we don’t teach it. Steve: I already knew the answer to that question before I asked; of course the answer is yes. And so I want to talk about your entrepreneurship framework, kind of regarding how you start from an idea all the way through the implementation of a business, and I’d like to actually address the creativity and innovation problem first. How can you become more imaginative, creative, and innovative? Tina: Yeah, so first let’s start out with the definitions, and I have to tell you I fell into a trap that everybody falls into, the trap is around using these terms, imagination and creativity and entrepreneurship and innovation, all sort of interchangeably. And so it becomes a big soup, and therefore what you think we’re talking about is really different than what I think I’m talking about, and we’re talking past each other, and it seems very unscientific. And so, I decided to put a stake in the ground with some very clear and easy to remember relationships and definitions. So here they are. Imagination is envisioning things that don’t exist, pretty straightforward, right? I mean it’s something we all do right; I can envision a butterfly flying around my room. Creativity is applying that imagination to solve a problem, innovation is applying the creativity to come up with a unique solution, and entrepreneurship is in applying the innovation to essentially scale the idea. So what you’re seeing here is a hierarchy of skills from imagination to creativity to innovation to entrepreneurship. One thing I want to underline, highlight, bold is that the difference between creativity and innovation is very important. Creative ideas are new to you, but innovative ideas are new to the world. And it’s really important to distinguish between those two, because if you really want to come up with innovative ideas, something that is new to the world, that’s fabulous. But if you use the concepts of creativity, you’re going to really stop short of coming up with reaching that goal. So anyway, those are the definitions, and I like to compare it to learning how to talk. So if you think about it, babies naturally babble right, they just make noises. They apply those sounds to make words, apply the words to make sentences, and the sentences to make stories. And it’s the same hierarchy going from sound to word to sentence to story is the same as going from imagination to creativity to innovation to entrepreneurship. They each are the application of the scope before. Tina: Well, I’m just using it as a metaphor, just as an example. And the idea though is that — and this is very important is that, in this I call the invention cycle is that when you get to the end, it leads back to the beginning, which is one of the most powerful parts of this framework is that once you’re entrepreneurial and have scaled your ideas, you can only do this by inspiring other people’s imagination. So it leads to their — it triggers the cycle for them as well. Steve: So what are some exercises, so you mentioned like innovative means that something is new to the world and not just to yourself. So for those people out there who don’t think that they’re innovative at all, like what are some exercises that you can do to actually come up with innovative ideas? Tina: Great, I love that question. This is what I spend 99% of my time in my classes doing, it’s coming up with ways to do this. So the most important thing is to question the question you’re asking, that is to reframe the problem. That’s where the innovation comes in, is when all of a sudden you look at the problem from a very different angle. For example, let’s say it’s your birthday, when’s your birthday? Tina: Okay, so we have some time to plan here okay. We can say, okay Steve it’s your birthday, we’re going to brainstorm about the best birthday party. And that might seem like a really good idea to brainstorm about the best birthday party. But if we question that question, and change the word party to celebration, let’s plan the best birthday celebration, what happened to the set of solutions? Steve: So that opens it up to more. Tina: Many more, what if I said, let’s find the best way to mark your birthday. That becomes an even bigger set. What if I said, let’s come up with the best birthday present, or the best birthday card or the best way to surprise you on your birthday, or the best birthday ritual? Here is the key; the answer was baked into the question. When I ask the question, there is an assumption about what the answer is. If I said we’re going to have a birthday party, the assumption is it’s a party. And so if you really get good at questioning the questions you ask, in fact I like the concept of frame storming. It means you actually brainstorm about the questions you’re asking before you even start thinking about the solutions. This is something I feel so passionate about. What happens is people rush to the solution, because that’s the way our school system is, right? You get given a question and you have to rush to the solution, you know what’s the sum of five plus five, ten, right? I get to the answer. But what if I question the question? What if instead of asking, what’s the sum of five plus five, I said what two numbers add up to ten? We’re not going to come up with an infinite number of solutions. So you need to fall in love with the problem, not the solution. Steve: We need some examples here. Tina: Okay, I’ll give you lots of examples. I mean I gave you the birthday party example, but imagine, let’s make it really serious. Let’s say I’m really interested in dealing with people with cancer. So I could say the problem I’m trying to solve is how do I cure cancer. That’s, again it sounds like a great question, but what if I say well how do I prevent cancer, or how do I allow people to live better lives with cancer, or how do I deal with the families of people with cancer? So if you actually spend the time thinking about the question you’re asking, you’re going to really open up the frame. So question the questions. One great way to do this is to unpack all of your assumptions about a topic. So I could, I don’t know, pick any topic, it could be restaurants, what are all the assumptions I have about a restaurant, or a hotel, or a family vacation? And once you unpack all those assumptions, you can then turn them upside down to start coming up with some really interesting new ways of looking at the problem. Steve: I just want to take a moment to thank Kabbage for being a sponsor of the show. Now if you run a successful e-commerce business like I do, you probably know that the worst thing that could happen to you is to run out of stock. Now my wife and I regularly import container loads of merchandise from China, and sometimes you need a short term loan to buy enough inventory to meet demand especially during the holiday season. Well if you’re wondering how to get the funding needed to run a small business today, Kabbage has the answer. Kabbage helps small business owners access simple and flexible funding right away without the headaches that come with applying for a traditional loan. Apply online or from your phone by securely linking your business information to get an automatic decision. There’s no waiting in line, scanning documents, or tracking down financial statements. Kabbage gives you the flexibility to decide what is best for your business, and once you’re approved you choose when to use your funds and how much to take. You’ll only pay for the funds that you actually use, and it’s a line of credit that can be used for your purchasing needs. Kabbage has supported over 100,000 small businesses with over 3.5 billion dollars in funding. So visit Kabbage.com/ wife. There is no cost to apply or to set up your line of credit, and as a My Wife Quit Her Job listener, when you qualify for funding, you will get a $50 visa gift card that you can use anywhere. Now that’s Kabbage with a K, K-A-B-B-A-G-E. com/wife. Once again that’s K-A-B-B-A-G-E.com/wife, now back to the show. I see, so instead of limiting yourself with your language like the birthday party analogy. Everyone throws a party for someone right, but by opening it up; you could probably come up with something a lot more special, maybe a lot more meaningful by just making it more open ended questions. Tina: The other thing is more innovative, right? I mean now this is really critically important because not all the time do you want to come up with a innovative solution. Sometimes a creative solution is just fine. I mean I don’t have to reinvent the wheel every day I make my kid a lunch for school, right? So sometimes I just want to open the refrigerator and I use my imagination which is envisioning things that don’t exist, a lunch. And I go, okay fine I’m going to take the peanut butter and jelly and make a peanut butter jelly sandwich. So sometimes you know if I’m trying to get through traffic on the way to work, I don’t need an innovative solution, I just need a creative solution to do this, and that’s fine. And I think we should acknowledge that creative solutions are incredibly valuable for 99% of the problems we solve in our life, but for that 1% where you go, I really need an innovative solution, I need something that no one has done before, that’s when you really have to push further. Steve: When I was listening to your talk, one thing that really struck me was one of the analogies that you specified about puzzles versus quilts, I want you to go into a little bit about that, and how we’re trained in a certain way in schools, and how this puzzle versus quilt analogy really works. Tina: Yes, so I love this analogy, and I did not come up with it, I borrowed it from a colleague, Heidi Neck who’s at Babson. But I heard her talk about this and it really resonated with me. The idea is that people are really not tapped into their motivation properly, and that we don’t really think about it. Most people in the world just follow the motivations of other people. They go to work and they just follow instructions. And they are puzzle builders; they are people who basically — I mean think about doing a jigsaw puzzle. You pull out all the pieces, you start putting maybe this picture of the Eiffel Tower, you know someone else took the picture, someone else made the puzzle. You’re making the puzzle, but here’s the problem, you’re missing a piece, what do you do? If you’re a puzzle maker, puzzle builder, what happens is you’re missing the piece puzzle; you go, well, I can’t complete this puzzle, too bad. And these are the people who at work say, oh I’m sorry that part is out of stock, or you know the person we need is on vacation. I mean they have lots of excuses. But a quilt maker is quite different, they look at what the end goal is, okay I want to make a quilt, and they look at all the resources they have at their disposal to get to that goal. Again it’s falling in love with the problem not the solution. The puzzle is the solution, the quilt is the problem. So it’s like, okay how do I get there? And I’m going to use all the resources at my disposal. In fact there’s a great story I tell in one of my books about Peter Diamandis, who is the founder of the X Prize and Singularity University, he’s a really big thinker, he’s out there thinking about how to mine asteroids. And he walked into a colleague’s office, and the colleague had a sign on the wall, Murphy’s Law, if anything will go wrong, it will, Murphy’s Law. And he got so upset, and he picked up a sharpie and he went up to the poster and he crossed out, it will and wrote, fix it. If anything will go wrong, fix it. And that was the point, it’s the difference between the puzzle builder who’s saying if anything will go wrong, it will, versus a quilt maker who says, I’m going to figure out, I’m going to find a piece, I’m going to find a solution to get me to my goal. Steve: So one thing I really picked up when I was a student of yours was that there’s no right way to do anything, and a lot of my listeners are following these step by step programs on how to start a business. There really is no exact formula, right? You kind of just have to take what you’ve got, and then make the best of what you have. And when something breaks, you just got to find a solution, and there’s no really like set path, and the people that get stuck are the ones that you know they run into their first roadblock, and it wasn’t in their little protocol sheet on how to deal with it, and then they quit. And so that’s why I really loved your puzzle versus quilt analogy. Tina: Yeah, one of the biggest problems is that people don’t really deeply think about tapping into their own motivation. I do an exercise, and in fact I would encourage people to grab a piece of paper and a pen or just to say remember this, because it’s pretty simple exercise, but you can do it right now, okay, do you have a pen and a paper? Steve: I don’t, you know what I can’t walk right now, I’m still like, I still have my torn Achilles. Tina: Oh no, you can’t walk around, okay. Tina: It’s okay, it doesn’t matter, it’s pretty straightforward. Imagine a two by two matrix, a vertical and a horizontal line, a little chart. And on the vertical axis is passion, so high passion on the top, low passion on the bottom. And the horizontal line is confidence, so high confidence on the right, low confidence on the left. So the upper right hand side is things in your life where you’re highly passionate and highly confident. The upper left is you’re highly passionate, but not confident. The bottom left is not passionate and not confident, and the bottom right is highly confident, but not passionate, makes sense? Tina: Well you’d think it would be super simple to fill this out, and to put things in your life into these categories. But it’s harder than you think because people often don’t even think about the things in their life and how they fit into these boxes of what things they really care about, and their level of confidence in being able to deliver. But what’s really interesting about it is once you do this, and I really encourage people to do it. It takes a little bit of time, but it’s really well worth it. If you start realizing why are things in these different categories, like what about the things that you’re highly passionate and highly confident, so what would be something for you, you’re highly passionate and confident? Steve: And confident. Right now I’m feeling pretty passionate and confident about this podcast for example. Tina: Great, perfect. Do you spend time doing it? Tina: Yeah, of course you spend a lot of time, right? So you’re passionate about it, and then that led to your doing it, which has made you confident, right? So essentially you would not be confident if you hadn’t actually been doing it? Tina: Right, your confidence comes from the fact that you’re actually engaged in doing this. But what about things that you’re highly passionate, but not confident, can you think of something there? Steve: Yes, raising children, I’m not very confident, but I’m very passionate about it. Steve: How about teaching children, is that more specific? Tina: Teaching, yeah, yeah, yeah. You’ll see in a minute why. Okay so let me ask you this, teaching children, so you’re passionate about it, but why are you not confident? Steve: Because I’m not sure if the tactics that I’m using might have like long-term repercussions. Tina: Okay, and what would make you more confident? Steve: If someone blazed the path for me and gave me like some guidelines on what has worked and some statistics maybe. Tina: Okay, so more information, maybe spending more time actually focused on this? Tine: The things for most people that are in this category are things like skiing, or singing or cooking or whatever else, and they go, well how do these fit in your life? Well these are things I dream about doing, they’re not things I actually do. And what’s going to change to get it into the upper right quadrant is actually doing it, right? I mean I can say I’m really passionate about anything, but unless I actually do it, I’m not going to become confident. Now the things in the bottom lower left hand quadrant, you’re not passionate and you’re not confident, how do those fit into your life? I mean what might be an example? Steve: Of something I’m not passionate about and not confident about? Tina: Yeah, yeah. It’s hard. Steve: It’s hard because like if I’m not passionate about it, that means I’m not thinking about it. Tina: Yeah right. So let’s say maybe water polo. Tina: Okay right, so you don’t do it, like if you’re not passionate and not confident, you’re not doing it, you’re not thinking about it, it’s not even in your world. And maybe if it’s something that you really have to do, like maybe it’s you know washing dishes or doing the laundry, you might even choose to outsource to someone else, you might make a deal with your spouse that, you know what, honestly I’m not passionate nor good at this, and maybe you take that and I’ll take something else. So maybe you outsource to someone else, maybe hire someone to do it. The most interesting quadrant that was the lower right, where you’re highly confident but not passionate, can you think of something? Steve: I’m not passionate, not off the top of my head. Tina: I know it’s hard. Tina: So the thing that’s so interesting is that most of the things that are in for most people in the lower right quadrant are things they have to do for work. It might be doing spreadsheets or writing reports, or if someone’s at home it’s like cleaning the house, but you realize what is it that has limited their passion for this, I mean at some point they might have been passionate, why is it been lost? And you realize that in this chart, the way to get from the bottom to the top to increase your passion is a change in your attitude, it’s your mindset. And to get from the left to the right from a change from low confidence to high confidence is your actions, right? So let me ask you Steve, who’s in charge of your attitude? Tina: Yeah, who’s in charge of your actions? Tina: You are, that’s the point, you put things in this chart as if somehow it’s sort of carved in stone, but we are each responsible for understanding and for managing our attitudes and our actions. Now it doesn’t mean that everything in our life should be in the upper right hand quadrant. We shouldn’t be necessarily passionate and confident about everything, but to be very thoughtful about what things we want to have there and to basically say, okay these are the things I’m going to put my energy into. And I think that probably when you’re working with people, you see the same thing is that what’s getting in the way of their success is many times their attitude, and many times their actions. Steve: That’s correct, but if they’re not passionate — so one question I often get asked is, should I pursue this business if I’m not passionate about it? Tina: Well okay, this is super interesting question. I love this because people often talk about their passions; I need to find my passion. And it is the wrong question to ask, because passions do not come from nowhere, passions come from engagement with the world. So let me just give you a bunch of examples. I mean it’s not until you’re engaged in the world that you start seeing things that might spark your passion. I tell a story, I don’t know if I told it in that talk that you watched about Scott Harrison, did I tell that story? Steve: I don’t remember the name. Tina: Let me quickly tell you. Tina: Scott Harrison spoke at our entrepreneurial lecture series, and he’s super impressive guy, started an organization called Charity Water. And they bring clean drinking water to the hundreds of millions of people around the planet who don’t have access to it. Now very impressive guy, but he wasn’t always such. In fact in his 20s, he was a self described loser. He worked in New York, he was a nightclub promoter, and his job was to get people drunk and the drunker he got them, the better, he was really good at this. And one day he became an alcoholic, a drug addict, his life was a mess. And one day he woke up, he was down in South America and he said, you know my life is a disaster, I am really a loser, I need the opposite of my life. And to make a long story short, he made a decision that he wanted to do volunteer work, and he started writing letters to all of these charitable organizations around the world, and honestly they all wrote back and said like no, you can’t work with us, you do not look like you could contribute. He kept writing letters and finally he was invited to go on and work with an organization called Mercy Ships, where they send doctors on these floating boats to parts of the world where they don’t have access to doctors. So he jumped at the chance, and he went to Liberia, he didn’t even know, this is important, he didn’t even know where Liberia was. He had to look it up on a map. He went there; he was quickly taken with the fact that so many people there were stricken with horrible water borne diseases. He thought I have to do something about this; I have to do something about this. And so he went back to New York, and using his knowledge of how to promote things, he had been a nightclub promoter, he started promoting the idea of helping people get access to clean drinking water. And the point is before it is your passion; it’s something you know nothing about. He didn’t know about Liberia, he didn’t know about their water issues, he didn’t know about the diseases. But once he was engaged, he started getting excited about how he could make a difference. And engagement is the master key that unlocks everything; you need to start doing things. And here’s what’s really important, you don’t need instantly to be struck by lightning to say, oh my God this is my passion. You start with a little bit of motivation, like wow, maybe I could do something to help these people, or maybe I could solve this problem. Tina: My guess is this is true with you in your business, like your wife had a problem trying to sell some of her products, and you thought well you know let me do a little experiment and see if I can be helpful. And like wow, that’s really interesting, you got some really puzzle results, then you got more motivated, am I telling the truth here? Steve: Yeah, actually the problem was that she wanted to stay at home, and we needed to earn income through a place to sell. Tina: Okay, exactly and you had like, okay how do I do this? Let me do an experiment, right? And then you go, okay, well that worked, well that’s kind of interesting, let’s try something else. And you kept — your motivation led to some experimentation which led to more motivation and more experimentation, and pretty soon you were so motivated, and you said, okay great, now I’ve got something. And this is a very key part of this invention cycle is understanding that motivation and experimentation process. I just want to take a moment to tell you about a free resource that I offer on my website that you may not be aware of. If you’re interested in starting your own online store, I put together a comprehensive six day mini course on how to get started in e-commerce that you should all check out. It contains both video and text based tutorials that go over the entire process of finding products to sell all the way to getting your first sales online. Now this course is free and can be obtained at mywifequitherjob.com/free. Just sign up right there on the front page via email, and I’ll send you the course right away, Once again that’s mywifequitherjob.com/free. Now back to the show. Back on the axis that you were talking about confidence versus passion, do you actually recommend people look at what they’re confident at but not necessarily passionate about when thinking about something to pursue? Tina: That’s a really good question, yeah that’s a great place to start. But you don’t have to, because you could go there and say, okay how do I change my attitude about this thing that I’m really good at right. Like maybe I’m really good at cooking, but I’m not really passionate about it. Okay, how can I leverage this? I think it’s probably more fruitful to start in the upper left hand corner, and say, what are the things I’m really passionate about that I’m not confident, how can I build my confidence? Because I think the passion is probably a much bigger driver than confidence. Passion leads — the reason that you’re confident about your podcast is you started with a little bit of passion, a little interest, which led you then to do, to the behaviors. I think that that’s often the place to start is not your skills but your interests, does that make sense? Steve: Yeah, the reason I’m asking that question is because in that lecture that you gave, which I should probably link up to after this in the show notes, you had an example of a waiter. Tina: Yeah, yeah, yeah. Yes but what I would say there is — so let me just replay that little story. The idea is that anything — the idea is that you can start anywhere, and this is the point is that you can start anywhere, you don’t have to be in some fancy place, you don’t have to get on a boat like Scott Harrison to go to Liberia. You could be a waiter at a restaurant, and by really paying attention, you’re going to notice opportunities. You’re going to notice, wow people are ordering a lot of gluten free food, or wow you know, how can I get higher tips, or wow there’s one customer here who’s diabetic and has certain needs. And you could use that small motivation to solve that problem to end up building up to a whole career, right? If you’re just interested in getting higher tips, let’s say you’re just really want to earn more money, and you start becoming an expert on customer service because you’re seeing every single day what experiments you do lead to higher tips, you can then parlay that into you could become a consultant to other waiters, you could start a consulting company, you could write a book, you could make a movie, you could start a whole you know restaurant chain based on your insights. So it doesn’t really matter where you start, and this is really critically important. But there it was based on again motivation, on my passion for earning some more money that had led me to do some experiments. Steve: Let’s talk about the experimentation phase. Let’s use that waiter analogy real quick, let’s say this waiter you, he’s been working in a restaurant, he wants to start his own restaurant, and he’s deciding on the menu, right? What are some of the first steps? Tina: Yeah, I love this. So one of the concepts I talk about in my book is one that I learned from my colleague Alberto Savoy, and he’s just so brilliant. And he started several very, very successful companies, but also had some failures. In fact his first company, they sold for 100 million dollars, the second company lost 30 million dollars. And he thought, wow what happened here? And he realized that oftentimes you are building the wrong it. You might be able to build it right, you know how to build it, but you’re doing the wrong thing, and he realized that you need to do these tiny, tiny little experiments, and he calls them pritotypes [ph]. So with the restaurant, the pritotypes could be super simple. What I would do and what he would recommend is, let’s say you want to put together your menu, just start putting some things on the menu that you haven’t even made, and see if people order them. You can always say, oh out of stock on that. But let’s say I thought, well I wonder if people would order lobster, and lobster is going to be really expensive for me, and I know so I’m going to have to charge a lot of money in my restaurant. I can just put it on the menu and see how many people order lobster, and I go, oh I’m sorry, unfortunately we ran out a lobster, we had all the fresh lobs — we don’t have it, but you know would you like to have some other thing, okay? And you can quickly get some data. You can do this in so many ways. These pritotypes are such a fun and easy way to get to data about whether your idea works very, very quickly. One of my favorite — can I tell you my favorite example? Tina: Is Jeff Hawkins who happens to be a good friend of mine, and I’m just like his biggest fan. Tina: The Palm Pilot, he’s the founder of Palm and Handspring. But most importantly he’s a self-taught neuroscientist, and has — is like running a company now called Numenta that is really trying to reverse engineer how the brain works. And when he was starting Palm though, he knew he could build it, he knew that he had the technology to build this handheld device, but he wondered would people want it? I mean really the Apple Newton had failed, so would this be something people want? So you know what he did? He just made a block of wood, a block of wood, the form factor of a Palm Pilot, and he just covered with a piece of paper, a little sleeve of paper and kind of wrote on it the things he imagined would be on it. And so that was his text, he carried it around for a few weeks to see how he might use this thing. And so once he realized, hey guess what people would actually find this really interesting that he decided it was time to start — go into the next stage just trying to build it. Tina: Yeah, it’s a really good question; because it’s a really good question how many people do you have to test it with. And I would argue you would need a lot more people, but I love the idea that you know just the concept that he carried around a block of wood for a few weeks, and wanted to get a sense of like how he might use it. But in a real pritotype you would give something like this to other people as well. Tina: Oh yeah, you should be able in a very short period of time with a very small amount of money. One of the biggest problems is that people fall in love again with their solution, so they spend a lot of time, a lot of money, a lot of resources, a lot of energy building something and only to find out afterwards people don’t like it. But you know a few Google ads, a few you know put up some flyers. Let’s say I want to run a workshop, I can put up some flyers around campus and see if people time often call me. If I get enough, guess what, I’ll schedule the workshop. Steve: So let’s the reception is positive, like how do I still know whether the idea has legs or whether it’s innovative enough so to speak? Tina: Say more, what do you mean? Steve: What I mean by that is, so you’re in the beginning where you were talking about creativity and innovation, and innovation is something that the world doesn’t necessarily have, it’s new to the world, right? How do I know whether the interest is innovative versus just something that’s nice to have, does that make sense at all? Tina: Well, I think the key is whether people are actually going to buy it, right? People need to have skin in the game, and one key thing that people often don’t realize is I can ask people for their opinion, I can say do you think people would like this, do you think people would like this, would you buy it if I made it? And they go sure, sure. It’s easy for people to say that, but if I actually have to do something, even if suppose giving you my e-mail address, or putting five dollars down, think about you on mask, he the Tesla, he makes people put $5,000, I think it’s 5,000. Put some amount of money, a significant amount of money down before they buy the car. Tina: I mean that is a perfect example of skin in the game. People have to say, yes I want it and I want it so much, I actually will give you some money for it. Then you’ll go build your car. Steve: Okay, and so if you have – let’s say people are willing to pay you money for this, and you think your idea has legs, what is kind of like the next step, how do you actually take that then, and actually turn into a real company? Tina: Yeah, so that’s really important. So in each of these stages of the invention cycle, there is an attitude and an action. We talked about that framework, the confidence, and passion matrix and looked at the importance of attitudes and action as well. Attitudes and actions happen in this entire cycle, and I’m going to get to what happens in entrepreneurship in one second. So imagination requires engaging in the world, and envisioning what might be different. Remember we talked about your passions follow engagement, so engaging the world and envisioning might be different. Creativity requires motivation and experimentation. We talked about that, that a little motivation, a little experiment. Innovation requires focus and reframing. We talked about that looking at problems from a different angle to come up with something really new. And entrepreneurship requires persistence and inspiring other people, okay. So persistence is all the things they teach in all of our other classes, strategy finance, marketing, organizational behavior, leadership, all this stuff. But the inspiring other people is one of the key things; it’s being able to tell a compelling story that engages other people in a really meaningful way. And that storytelling ability allows you to attract people to your team, attract investors, interact customers, attract people who are going to write positive reviews about your product, all those things that are needed. Because to be successful it’s a barn raising, it’s not an individual effort, you need to get other people as motivated and as excited as you are. Steve: Can you give us some examples? Steve: I guess what I’m getting at is you know, is the product itself good enough, or I mean does it always have to have a really good story along? Tina: Yes, yes, yes, absolutely. You can have the most amazing product, but if you can’t tell a story that places me in that, you know places me in the story, and allows me to see what the world would be like after this product affects me, you’re not going to sell it. You do this all the time Steve. You have a story to tell that allows people to see how their life can be transformed by using the tools that you deliver, and that you teach. I know that, I mean people are inspired by the vision that you’ve created a future for them. Steve: I guess it’s just something I don’t really think about specifically. Tina: Yes, but it’s really helpful. So the story structure I like the most is called the story spine, and it’s a super simple framework. It’s been picked up, and it’s used in many places, it will sound familiar. It’s a little harder to use than it sounds on the surface, and it takes some practice, but here’s an example, super simple. Once upon a time, sounds familiar already? Tina: Okay, once upon a time and every day. So now what I’ve done is I’ve set the stage about here’s what the problem statement is. And it doesn’t have to be once upon a time, it could be you know what, there are 500 million people who suffer from debilitating tremors from Parkinson’s like diseases. And every day they struggle with feeding themselves and buttoning their shirt and drinking a cup of coffee, and this is incredibly stressful to them and their families, and I paint a picture of what this is, and then I go, until one day. And that’s where you have your intervention, until one day, and here’s my invention. And then you paint the picture of all the consequences. You go because of that, and because of that, and because of that, because of that, because of that you can have as many because of thats as you want, until finally and ever since then. So what I’ve done is I paint a picture of a problem, and it could be any problem. Every day, our kids walk to school, and they carry big huge backpacks, and they end up really hurting their backs, and it makes them — impossible for them to study in school, and this is such a terrible thing. You could pick whatever you want, until one day we came up with a way to put all the books on iPads, and because of that the kids have their information with them all the time, they don’t hurt their backs, they blah, blah, blah. And because of that you know and as a result until finally all kids have their books on these iPads, and ever since then this has become the standard for the way we deliver this. Steve: How does this model apply to a product that isn’t necessarily have utility value, for example like clothing or jewelry, like how would you frame the story there? Tina: Well if you think about it, the way that the clothing and jewelry is actually sold, it’s very aspirational. You paint a picture of what your life is going to be like, if I wear these jeans, I’m going drink this Coca-Cola, or wear this necklace, I’m going to be cool, and I’m going to have lots of friends, and my life is going to be better. I mean people buy these things because they actually have some sort of dream and vision of what they’re going to actually do for them. Tina: I mean is that true? Tina: And so if you look at any commercial, you’re going to see this story spine play out. I could give you some examples that I can send to you that you can put some links of fabulous commercials that tell use the story spine incredibly effectively. Steve: Do you have any thoughts about how to stay persistent; is this just a mindset sort of thing, like how do you force yourself to stick with something even though it might not be working at the moment? Tina: Yes, so when you go through the invention cycle of going from imagination to creativity, innovation to entrepreneurship, the mindset piece, the engagement, the motivation, the focus, and the persistence which are the four attitude pieces of it, get harder and harder. I mean let’s not pretend it’s easy, and that’s why not everybody is successful, because that focus and that persistence that requires in the innovation and entrepreneurship stage are really hard. And it’s particularly hard when it’s against in the face of disappointment, when things don’t work, and you have to keep pushing. But that’s what differentiates those people who are successful from those who aren’t is being able to really muster the grit that’s required to get through the hard times, and also to build the team. And I just want to say, one of the most effective things is to build the team around you to buoy you up, and to help support each other when things are not going well. Steve: I was just curious like kind on the flip side how do you know when to give up on an idea? Tina: Yeah, super good question. I get asked this all the time, and it’s something that you know we all have to struggle with internally. Interesting enough many years ago one of the PhD students in our department did her research on when do founders sell their companies. And there had been a lot of research that had already been done about why do big companies buy small companies, but she looked at it from the other — she sort of reframed it, said, let’s look at the small companies, like why do they sell? And it was always when there was some life event that triggered that. Like you know what, I really don’t want — like I’m burned out, I don’t want to work this hard. Or I just had a kid, or my wife is going to, or husband is going to leave me if I don’t stop working this much. There was something that was going on in their own personal life that led them to make that choice. And that’s true in everything we do, we have to make that choice of how much we want to keep putting into a problem. If you’re passionate enough about it — one of the things I do, an exercise with my students on risk taking and failure, and I go through this whole exercise with sort of giving them the opportunity to put a financial value or a time value on different things. And I’ll go like how much time would you put into solving a problem that you weren’t sure you could solve, like curing cancer? And it’s really interesting, different people have really different amount of times. Some people say a lifetime, like I would commit my lifetime to this, and other people go, you know four years. People even know in advance how much they would put in, how much persistence and grit they have. Steve: So would you recommend that people kind of bound their efforts then? Tina: I think really knowing yourself well enough, and taking on projects that fit within the scope of what you’re willing to give, I mean there are some people who say you know what, honestly my priorities in my life are this right now. I mean so for example your wife wanted she work at home, she probably wanted to stay home with the kids. She probably said, I have this much time to put into my work. Tina: Exactly, and you go I’m going to go handle to the metal for two years, but you said, I’m not to do this forever. You said, I’m going to see what happens. But it might be something like if you had a family member who was suffering from some ailment, you might say, I’m going to give my life, my entire life to try to solve this problem. Steve: Right, right okay. Tina we’ve been chatting for quite a while. I know you have another appointment in like five minutes, so I wanted to just end with, Tina where can people find you online, what is your next book that’s coming out? Tina: Yes, so thank you for asking. I’m easy to find, I’m on Twitter at @tseelig, that’s T-S-E-E-L-I-G, and I also have a website which is just TinaSeelig.com, and I have medium where I blog. So you can find me there at Tina Seelig medium. But I’m super excited; I have a new book coming out in just a couple weeks, on September 26th. Steve: Oh that’s right around the corner. Tina: It’s called Rules — yeah it’s called Creativity Rules, and I’m super excited to share it. It describes the entire invention cycle framework with lots of examples and also some assignments at the end of each chapter that leads you through the process. Steve: And Tina is an excellent teacher, she was my professor way back in 1999. Entrepreneurship can be taught, and hopefully we touched on a bunch of the things that are necessary for you to get started. I highly recommend Tina’s — I’m going to link up her speech which is podcast based which was excellent. She’s an excellent public speaker, and she’s an excellent writer as well. So I highly recommend that you guys go check out the book. Tina: Great, thank you so much, it was really a pleasure, and looking forward to seeing you again soon. Steve: Yeah thanks a lot Tina, thanks a lot for coming on the show. Steve: Hope you enjoyed that episode. Now I owe so much to Tina, it is actually her class that I took back in the day at Stanford that actually gave me the courage to start my own business. Anyway do yourself a favor, head on over to mywifequitherjob.com/Tina, that’s T-I-N-A, and go pick up her book. It’s called Creativity Rules: Get Ideas Out of Your Head into the World. I’ve read it myself, and it’s a great book if you have ideas and don’t know where to start with your business. I’ll also be giving out copies to anyone who purchase my online store course and pays in full until October 1st. For more information about this episode, go to mywifequitherjob.com/episode180. And once again I want to thank Seller Labs. Their tool Scope has completely changed the way I choose keywords for both my Amazon listings and my Amazon advertising campaigns. Instead of making random guesses, Scope tells me exactly which keywords are generating sales, and within the first week of use I saw a 39% increase in sales. It is a no brainer. So head on over to Sellerlabs.com/wife and receive $50 off. Once again that’s sellerlabs.com/wife. Now, I also want to thank Klaviyo which is my email marketing platform of choice for ecommerce merchants. You can easily put together automated flows like an abandoned cart sequence, a post purchase flow, a win back campaign, basically all these sequences that will make you money on auto pilot. So head on over to mywifequitherjob.com/K-L-A-V-I-Y-O, once again that’s mywifequitherjob.com/K-L-A-V-I-Y-O.